St Patrick’s College will be hosting a special exhibition to mark the 200th anniversary of “Silent Night”. The exhibition, Silent Night 200 – History. Message. Present., by the Austrian Foreign Ministry, traces the origins of the popular Christmas carol’s lyrics and melody, its dissemination and also gives insight into the Carol’s Irish adaptations. 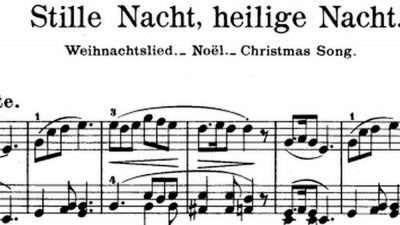 “Silent Night, Holy Night” (in German “Stille Nacht, Heilige Nacht”), originated in Austria in 1818, and is known in more than 300 languages and dialects around the world. In 2011, the carol was declared an intangible cultural heritage by UNESCO. According to Dr John O’Keefe from St Patrick’s College, legend has it that on Christmas Eve 1818, in the Austrian town of Oberndorf bei Salzburg, Austria, the organ broke down and consternation ensued. “Silent Night” has been recorded by a large number of singers from every music genre. The version sung by Bing Crosby is the third-best-selling single of all time. Weintraub said a German officer, Walter Kirchhoff, began to sing the song, first in German, then in English. Silent Night 200 – History. Message. Present. exhibition runs 17th to 21st December 2018, and 3rd to 7th January 2019 at the President’s Arch in St Patrick’s College, Maynooth. The exhibition is free of charge and open to the public from 9am to 6pm.